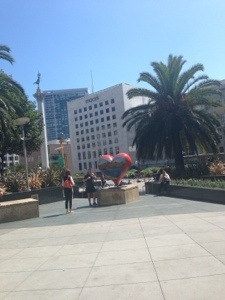 The US Trip: I Left My Heart in San Francisco! This is the sixth post of “The US Trip” series. To read other posts in this series, click here. The trip to San Francisco happened rather unplanned during my US Trip. I wanted to visit but it was not in my main itinerary as I was aware that it’s a 6hour-ish drive from Los Angeles and I had a tight schedule around LA and Orange County. However, I suddenly got an invitation to visit a relative of mine who found out that I was in California from my mum. At first I wanted to visit on the weekend but because of her schedule, I had to make the trip the next day. I remember it was a Wednesday afternoon after I finished talking with my relative on the phone and confirming my visit – I immediately searched for ways of public transportation from LA to SF… and I was a bit surprised to find Megabus! Back in the UK, I loooooved Megabus. They’re my savior because they have offers as cheap as £1 to travel to London’s neighboring cities. Anyway, thanks to Megabus I found cheap LA to SF tickets. The coach left LA (Union Station) at Thursday midnight and arrive in SF (Caltrain Station – 4th and King St) at around 7 in the morning. The journey was really convenient for me (except the fact that me and R did not get seats next to each other – the coach was full), I could sleep almost all the way and woke up just when we were about to arrive. Since we arrived at 7 in the morning and my appointment with my relative was not until 3 in the afternoon, we had some time to kill and decided to wander around town. We did not have specific itinerary, all I thought was to visit some of the obvious tourist spots if possible. Then I used google maps to find out where we were, and how far we were from Pier 39, Chinatown, or Union Square. We were surprised to found out that Chinatown was only 20 mins walk away and then another 20 mins-ish walk would take us to Pier 39! So we walked. Our first destination was Chinatown because we wanted to have dim sum breakfast. I actually don’t remember the name of that dim sum restaurant that we went to, but there are a lot of dim sum restaurants in the area – you can always choose one (tip: use Yelp if you want to check out the reviews.. really helpful!). It was an enjoyable walk despite the gloomy weather – compared to sunny LA, weather in SF can be discouraging! but I love SF’s city centre. There’s something about the vibe that the city has, not to mention the architecture was just very easy on the eyes. After breakfast, we walked again to Pier 39, another 20 mins walk. Because the sun’s up by then, it wasn’t as cold and gloomy as when we first walked to Chinatown – thus made it even more enjoyable! There are a lot of small shops and stalls in the area, it’s indeed a pretty sightseeing spot (You can see the Golden Gate Bridge from a far!). Plus, I also got to see some seals! Verrrryy cute. 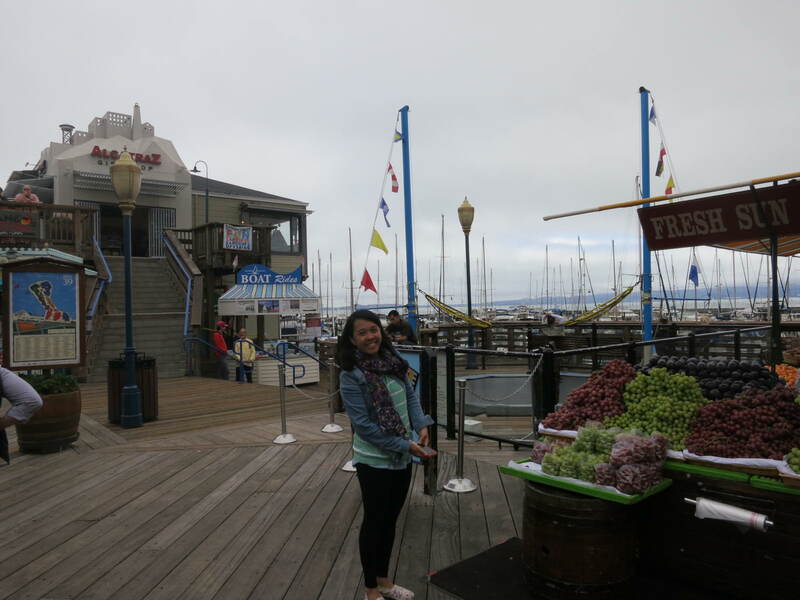 Pier 39 is next to Fisherman’s Wharf, where we had a quick lunch at the famous Bistro Boudin. It was, indeed, quite a splurge, but totally worth it. From Fisherman’s Wharf, we went back to the city centre because we wanted to see Union Square. But we did not walk back… This time we took the famous Cable Car! Woohooo! It cost us $6 for a single ride ticket and you can easily purchase the ticket in one of the stations (tip: my ticket can be used as 10% off voucher in Ghirardelli chocolate stores – another must visit in town!). Then it’s time to meet my relative. We met her at Ghirardelli Square. It’s another tourist spot – apparently the building is quite historic. But despite the historical facts, they have one of the best chocolates I’ve ever tasted. For sure! There’s a park in the area too.. again, I love city parks as it’s almost a luxury in Jakarta. We also met R’s friend and then the four of us went for another round of sightseeing – this time R’s friend drove us around. Our first stop was Lombard Street. There’s really nothing there – it’s just a residential area…. BUT with stellar view. Perfect for pictures! 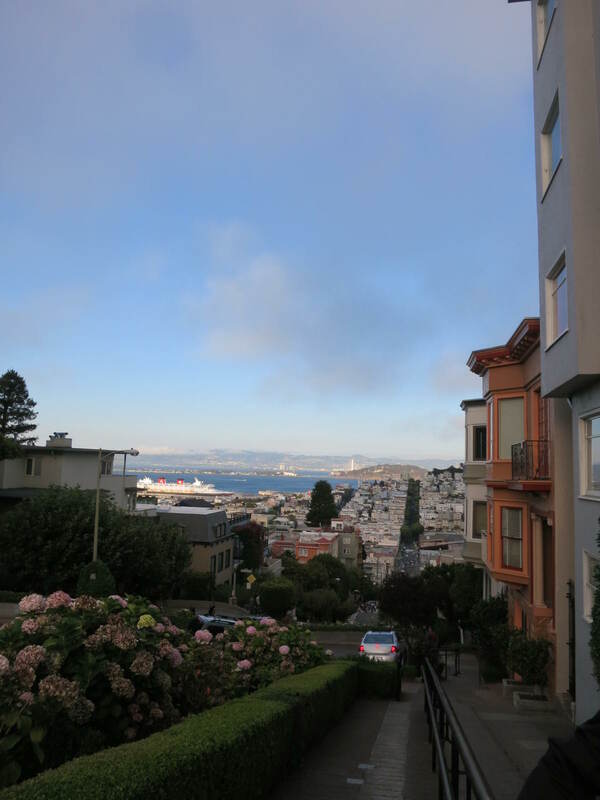 View from Lombard Street. In love! Of course, we HAD to see the Golden Gate Bridge. If you were to take public transportation, this link should help. There were some spots to take pictures with the bridge in the background, and you can do some sightseeing too. We didn’t spend too much time here, simply just click and go! Last but not least, we went for a quick sightseeing trip to Treasure Island. Though it was too cold to stay for a long time, I was sooo happy to be able to see such breathtaking view of SF’s city lights from a far. Too bad both my iPhone AND camera ran out of battery by then.. So I didn’t get to take any pictures! (boohoo). But feel free to browse some images curated by the lovely google here. After Treasure Island, we went back to our bus station to catch the midnight bus back to LA. So that’s how we spent 16 hours in San Francisco. I guess we pretty much covered anything… well, most of tourist spots for sure. I fell in love with San Francisco instantly even after such short visit.. and of course, would love to come back again and spend more time.